IRELAND’S GREAT UFC hope Conor McGregor is training hard ahead of his upcoming fight but got a taste of ‘the good life’ during a recent trip to Las Vegas. The Dublin featherweight is three weeks out from his second UFC bout, having annouced himself on the world stage by taking out Marcus Brimage 67 seconds into his debut back in April. This month, McGregor and his coach John Kavanagh travelled to Sin City for some training at Zuffa headquarters and were paid a surprise visit by UFC president Dana White, who flew up from Los Angeles especially to see them. 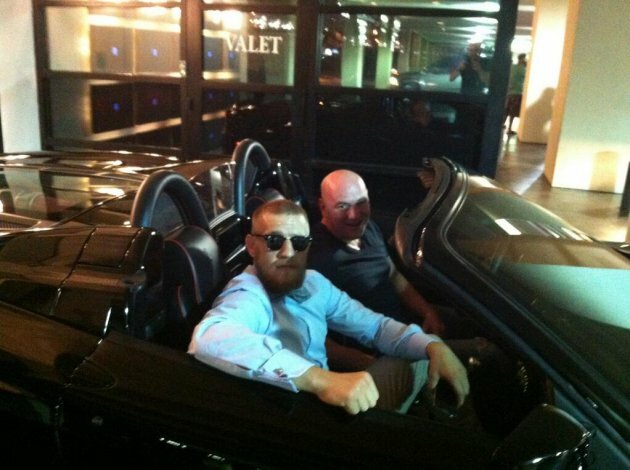 McGregor, who takes on Hawaiian Max Holloway in Boston on August 17, was brought out for a steak dinner before the pair went for a spin on the Las Vegas trip in White’s Ferrari (watch video here). Such an occasion might make an upcoming fighter believe they have ‘made it’ in the big time. McGregor, however, is keeping grounded and insists the surreal experience has made him even hungrier for success. When things like this happen some people might think they’ve become part of the organisation,” he says. “That’s not me. I don’t get comfortable just because I’m on personal terms with the boss. I don’t plan on getting lazy. The UFC president has certainly taken a shine to his new Irish fighter ever since McGregor picked up ‘Knockout of the Night’ on his debut. In an industry which lacks larger-than-life characters, White can see that his recent addition has the ability to excite fans – both inside and outside the Octagon. He is also keen to return to Vegas: “I definitely want to headline shows there. Seeing Mandalay Bay and the MGM and all these big arenas, and then going out with the boss was unbelievable. Hugely ambitious and eager to reach the top, the Dubliner has been calling for big name fights despite being a relative newcomer to the UFC. He will have to rack up a couple more wins before getting anywhere near a title shot, however. "Dana said: 'I would love nothing more than for you to get that belt tomorrow', but he was telling me that he doesn't want to rush me. I want that title and I’m ready for the big fights. I can sit here and say this all day long but only the contest can prove this. People are saying this guy is good and that he’ll cause problems but I’m the big problem." All going according to plan, McGregor believes he will bring the UFC back to Ireland for the first time since 2009, when an event was held at Dublin's O2 Arena. Although it didn't come up in conversation with White, he claims it could return as soon as next April. "We didn’t specifically talk about a Dublin event but honestly I would be very surprised if they haven’t had an event here by April of next year with all the buzz around. I’m really looking forward to that - to fight in my home town. "I’m fighting Boston in three weeks and that’s as close to Ireland as you’re going to get. I’ve got a lot of hungry young team-mates who are right behind me. They’re looking for their big break. To give them a show and get those guys on an event is what I want." UFC 163 will be live and exclusive on Setanta Sports this weekend and UFC fighter Conor ‘The Notorious’ McGregor was in Dublin today ahead of the event which takes place in the HSBC Arena in Rio de Janeiro in the early hours of Sunday, 4th August 2013. Subscribe now for €19.99 per month either online or by calling our subscriber line on: 0818 20 30 40. From August 1st, Setanta Sports customers will be able to receive BT Sport 1, BT Sport 2 and the ESPN channel as part of the Setanta Sports Pack. This game changing deal means that Irish UFC fans will be able to watch over 30 live events per year, as well additional UFC programming such the Ultimate Fighter and Inside the Octagon. Email “‘Meeting UFC president Dana White in Vegas has spurred me on’ – Conor McGregor”. Feedback on “‘Meeting UFC president Dana White in Vegas has spurred me on’ – Conor McGregor”.